Ultimate Halloween Pumpkin Badge. A really creepy looking orange pumpkin with an evil smiley face on a black background, ideal for Halloween parties and trick or treat gifts. These also make great additions to school uniforms and costumes at halloween and they are so cheap. 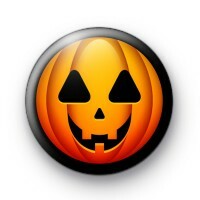 We have a huge selection of halloween badges so be sure to check them out.